In 1959, Robert V Pound and his student Glenn A Rebka observed that the wavelength of upward-directed gamma radiation over an elevation of 22 meters becomes fractionally longer by 2.5×10E−15, an amount predicted by general relativity. The Pound-Rebka experiment, done at Harvard, used Mössbauer techniques (discovered only in 1958) to minimize the recoil Doppler effects in the 14 keVgamma rays emitted from iron-57. Sculptures of the form shown could be 2 meters high for indoor display, perhaps mounted on a wall. Or, more ambitiously, a 22-meter structure could be mounted on the exterior wall of the Jefferson Laboratory where the experiment was done. Gravitation also affects the deBroglie wavelength of neutrons. This was elegantly demonstrated by an experiment at the University of Michigan’s Phoenix laboratory done in 1975 by Robert Colella, Albert Overhauser, and Sam Werner. They used an interferometer cut from a single crystal of to observe the quantum-mechanical phase shift of neutrons caused by their interaction with the gravitational field. 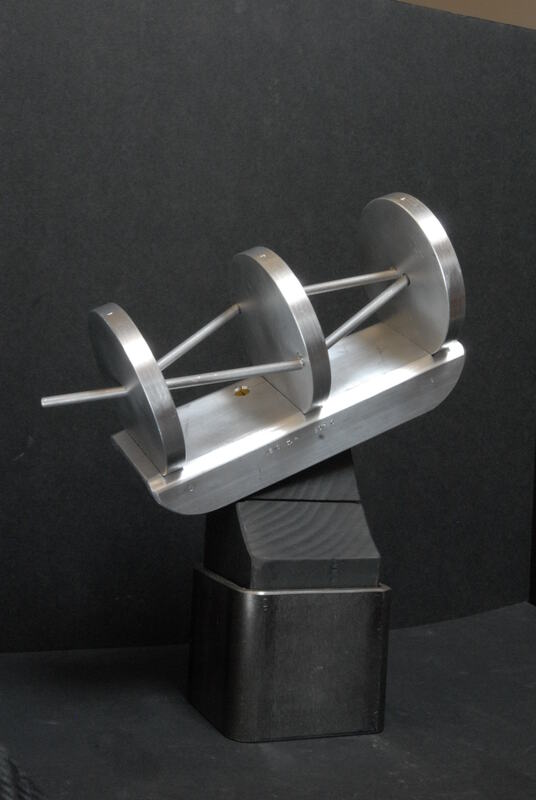 The sculpture’s form is based on the single-crystal interferometer.